The squirrel seems pretty content in little costumes, and it's as cute as it is mind-numbingly strange. 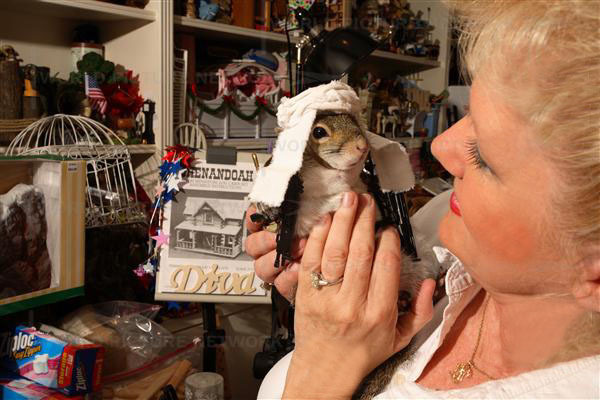 The person in charge is running an entire industry based on her pet squirrel. In an ironic note, she lives in Boca Raton, which means 'mouth of the rat'! You know, you read about crazy people doing crazy things & you say, "My God! Get a hobby!" And they do! Gage, writer...Ok, I can deny it no longer. I am in love with ALL THINGS SUGAR BUSH. What's not to love? Kelly Foxton is a genius: The Van Gogh of Country-Western Star Pin-up girl Supermodel Squirrel Photography. I salute you! Kelly makes her squirrel seem cute & innocent, putting it in a yuppie sweater & posing it like a high school senior picture, but you can't fool me. That thing would claw your eyes out for a peanut! You've gotta give Kelly credit... not many people could get a squirrel to do this. Squirrels are all evil and more intelligent than anyone realizes. This woman will be found tied to her bed & eaten slowly over weeks by a very small sharp-toothed creature. Mark my words!